You should be able to spot Tim Otten and Yashodha Chaku, although partly obscured by Jamie Novick, who organised the event, hosted at Gamesys, as kindly arranged by Andrew Tombs. Thanks also to Chanun Chirattikanon, of CompuCorp, for taking the picture. 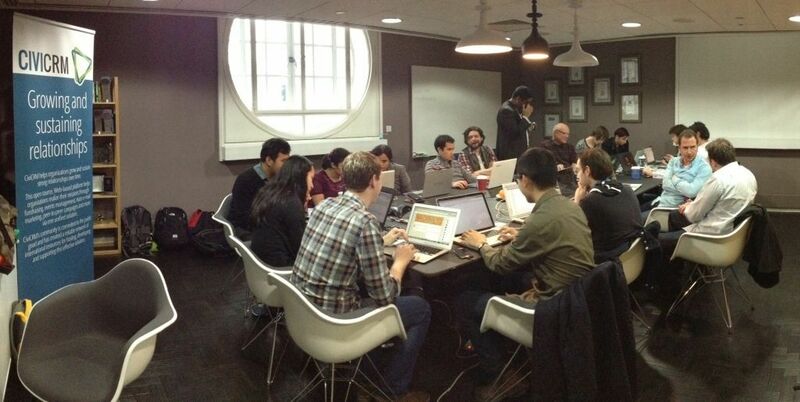 At the London Meetup last night, the idea of having a CiviCRM co-working day was discussed, so we are certainly planning to do that in London on CiviDay 2014 (Wednesday, January 29th), and wouldn't it be great if the same pattern could be followed around the world. The idea would be that the CiviDay Meetup in the evening would be at the same venue as the Co-Working day, ie that we book a venue for the whole day and into the evening, and that the venue has good wi-fi available and access to refreshments. This month's CiviCRM London Meetup will be on Wednesday 31st July, at Red Gallery (corner of Rivington Street and Shoreditch). G2 Crowd http://www.g2crowd.com/ is a web site that describes itself as providing business software reviews. They are currently running a comparative review of CRM products http://www.g2crowd.com/categories/crm/compare in which they classify CiviCRM as a 'small business' CRM (but then Salesforce is also classified the same way, along with Workbooks.com and Microsoft Dynamics CRM). This Meetup was kindly hosted by Leukaemia & Lymphoma Research, at their office in Holborn. Jamie Novick (of Compucorp) demonstrated CiviMail as a mass means of communicating by email and SMS. Owen Bowden (of LLR) demonstrated how to do surveys using CiviMail and WebForm-Civi which enables the key results of the survey questions to be stored in CiviCRM. CHASE is an annual conference/exhibition for charities and associations... http://www.conferencehouse.co.uk/CHASE/chase_home.aspx ...organised in London and has been running for some years now.